Vern's Toffee...perfect for a special occasion or to make any occasion special! "I've tasted some of the finest candies in the world, but Vern's Toffee is it!" "Our clients and friends have savored your butter almond toffee for over 15 years. ...we have shared a total of 2 ½ tons with people all over the country. Whenever we think we might try something else as our Holiday Gift (which isn't often) we quickly remind ourselves that there is nothing that compares with your wonderful toffee. Put another way, our success depends on your toffee." 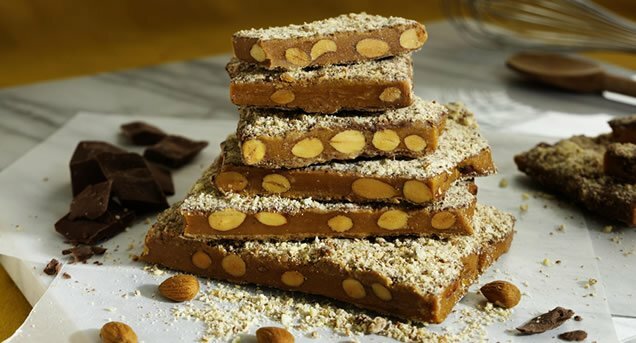 We are a family-owned and operated business that handcrafts butter almond toffee the old-fashioned way from our original toffee recipe. We select only the finest and freshest of all natural ingredients—dairy fresh AA grade sweet cream butter, two varieties of wholesome California almonds, sweet western sugar, and smooth, rich milk chocolate. Then we hand-blend these in small batches in copper kettles over an old-fashioned candy stove to insure you the finest, freshest, most mouth-watering toffee available. And, yes, our almond toffee is gluten-free. Whether you're looking for that perfect holiday gift idea or a rich rewarding indulgence just for you, our long-time, loyal customers will tell you Vern's toffee is your best choice. Vern's Toffee House is an old-school company that cares about forming long-lasting relationships with customers, that takes the time to get every order right, and, of course, makes sure that every box, and every bite, of Vern's Toffee is just as buttery delicious as the first. Since we are a small family-operated company, you’ll find our prices well below other internet companies. As a result, we stand out for our customers as a highly-treasured discovery: a company that delivers exactly what they want--pure toffee bliss--reliably, time after time and at a budget-friendly price. So you can save time and money by giving Vern’s scrumptious toffee to everyone on your gift list to savor at an affordable price. But caution: some people claim it’s positively addictive.